After all the planning and preparation, By the time your wedding day rolls around the only thing you should have left to worry about is getting gorgeous and walking down that aisle to say ‘”I do”. To ensure you remain a bridechilla, and do not risk ruining your wedding day with things that are actually manageable if taken care of well within time, here’s a list of everything you should be saying “I don’t” before and on your wedding. This is not the time to stress over the petty issues that are not under your control at least at this time of your life. Instead focus your energies on all the good that's finally happening and enjoy every moment - good or bad - that comes your way. Save yourself from all the anxiety attacks and keep yourself hydrated and full. 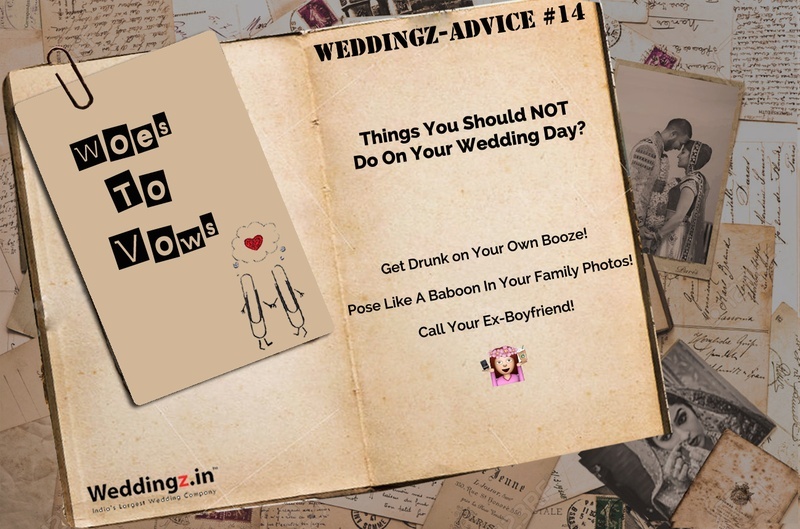 Do not make the mistake of skipping any meals with all the wedding jitters that you may (or may not) go through. Keeping your stomach empty for too long with all the excitement will only lead to gas and uneasiness building up towards your celebration time giving way to more unpleasant mood to seep in. Days preceding your wedding don't go overboard with your excercise regime. No one turns slim overnight. Choose light excercises that will will keep you refreshed and calm throughout the day. Go for a brisk walk or opt for yoga to calm your senses. You've done your bit with all the wedding planning, now is the time for you to relax and let the people in charge, take charge. You don't need to a be a super bride worrying about the vendors making it on time or not, your relatives receiving the favours or not. Keep responsible people in charge and let them take over. A day prior to your weddin or on your wedding day you definitely shouldn't be sitting to wrap those handmade favours or sit to write Thank You notes. Stay away from all your DIY projects, better yet get them arranged well before time. If you're planning to go for your honeymoon son after your wedding ensure you pack all the stuff you require for your honeymoon a week before and not a day prior or on your wedding day. Chances are you will definitely miss out on something more important. God forbid it's not your passport or visa. No matter what you do, do not turn into a bridezilla on your wedding day. This will not only spoil the fun moments for you, but also others present and helping you with your wedding arrangements. Cellphone addict?! Hand over your phone to your mom, bridesmaid or someone responsible who will keep you away from all the distractions during this big day of your life. You can always access your phone in between the ceremony and reception time, but ensure its not in your hand for too long so that you're not distracted with all the congratulatory messages pouring in or the Facebook posts with friends tagging your wedding or your relatives who've lost their way and asking for directions to your venue. Now, this is certainly what you'd like to stay away from, right! Its advisable to break in your shoes before the wedding. By breaking it in we mean wear them a week before so that you're comfortable in them on your wedding day, this way you will not deal with any blisters or aches that restrict you from enjoying your D-Day to the fullest. New makeup products should be tried a month before during your trial sessions with your makeup artist. This is advisable to avoid dealing with any skin rashes or breakouts on your wedding day. While spraying on some sweet scent is a must, if you dont want people dying of suffocation around you, avoid going overboard with your perfume applying it every now and then in between your celebration. 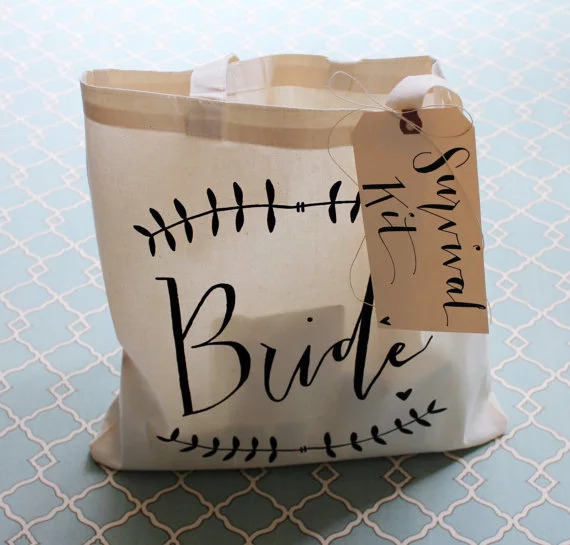 A bridal survival kit is all the amenities a bride would need in case of emergenicies, like dress tear, drink/food spills, headcahes etc. This one could easily slip one's mind with all the hullabulloo surrounding your wedding. Ensure the bride's mom or best friend has got this bit covered and keeps it handy at all times. While this cannot always be in your hands given traffic jams or any other unavoidable circumstances on your wedding day, delays bound to happen, we know and the guests know it too. But, wherever possible try to cut short on the delay and don't keep them waiting to avoid frowns and dissapoints when you finally arrive. Whether you're late or not, keep the wedding toasts short to say 5 minutes max. We know you have a lot of people to thank for turning your dream into a reality, but keep the speech short. For those you missed out mentioning in your speech unintentionally, go and say a personal thank you to them, that kind of gesture will be well appreciated too. Getting high on your own booze and being your clumpsy best in front of a hundred+ plus crowd is the last thing you would want to see on your wedding video. One glass of champagne and you should be good to go. Okay 2 is fine too, but don't go overboard to an extent where no one will be able to catch hold of you.